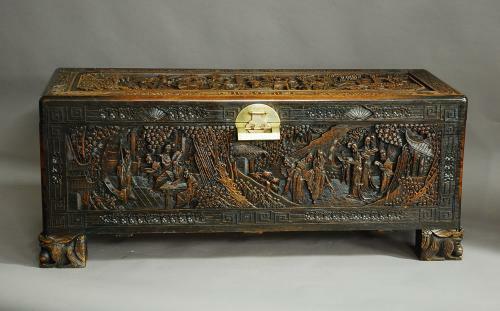 The chest consists of a superbly carved top of a traditional Oriental scene with a border of carved geometric and floral decoration with original brass clasp, lock and key. This leads down to the front, sides and back, also all superbly carved with traditional Chinese scenes with a border of geometric and floral decoration. The chest is supported by four carved feet in the form of foo dogs. When the chest is opened the interior has a wonderful fragrance of camphor with a removable tray (could be used for clothing). This chest would be a wonderfully decorative coffee table (a toughened glass panel could be made for the top) and equally would be a superb chest in which to store your clothes.